On 25 December 2012, His Holiness Patriarch Kirill of Moscow and All Russia chaired the last in 2012 session of the Holy Synod of the Russian Orthodox Church held at the Patriarchal and Synodal residence in St. Daniel’s Monastery. Taking part in the session are permanent members of the Holy Synod: Metropolitan Vladimir of Kiev and All Ukraine; Metropolitan Vladimir of St. Petersburg and Ladoga; Patriarchal Exarch of All Belarus Metropolitan Philaret of Minsk and Slutsk; Metropolitan Juvenaly of Krutitsy and Kolomna; Metropolitan Vladimir of Kishinev and All Moldova; Metropolitan Varsonofiy of Saransk and Mordovia, Chancellor of the Moscow Patriarchate; Metropolitan Hilarion of Volokolamsk, Chairman of the Moscow Patriarchate’ Department for External Church Relations. Metropolitan Aleksandr of Astana and Kazakhstan and Metropolitan Vikentiy of Tashkent and Uzbekistan were also included as permanent members by the decision of the Holy Synod of 5 October 2011 (Minutes 99) pending approval by the Bishops’ Council. 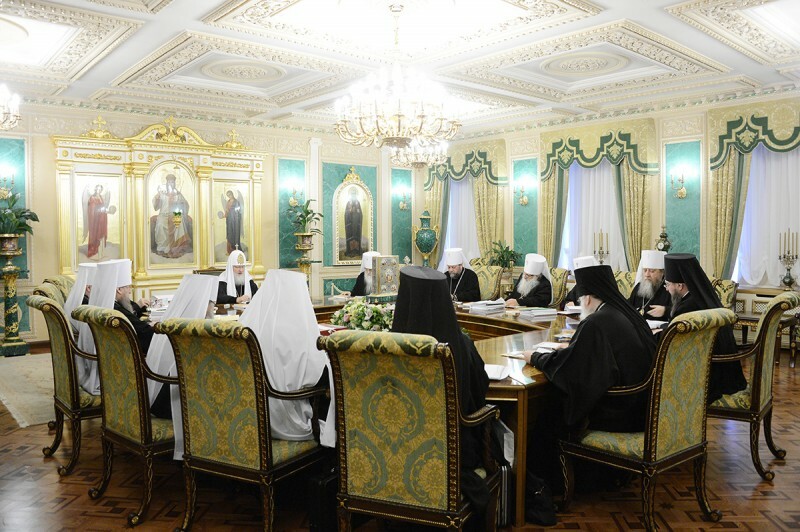 Invited to the winter session (September 2012-February 2013) are Metropolitan Vladimir of Omsk and Tavricheskoye, Metropolitan Veniamin of Penza and Nizhniy Lomov, Archbishop Mark of Hust and Vinogradov, Archbishop Simon of Murmansk and Monchegorsk, and Bishop Savva of Tiraspol and Dubossary. The Primate of the Russian Orthodox Church opened the session and addressed its participants with welcoming words. His Holiness Patriarch Kirill awarded Metropolitan Vladimir of Lagoda and St. Petersburg with the Order of St. Alexy, Metropolitan of Moscow, 1st class, in consideration of his fruitful archpastoral ministry to the Holy Church of Christ and in connection with the 50th anniversary of his episcopal consecration and the 60thanniversary of his ordination as priest. His Holiness informed the participants of the agenda and noted that the Synod will have to consider a lot of documents. The Synod will also sum up the involvement of the Church in celebrations that took place in the Year of Russian History: the 1150th anniversary of the Russian Statehood, the 400th anniversary of the Ending of the Time of Troubles, and the 200th anniversary of the victory in the Patriotic War of 1812.